The focal piece of a traditional watch is the front that holds the hands for marking time and normally placed against a solid background. Today Italo Fontana, creator of U-BOAT, stripped off this from the Chimera 46, leaving the inner workings of the watch on display. The distinctive and iconic case of the Chimera in AISI 316 plus blackened stainless steel, featuring bezel, body and caseback held together with screwed pins, today boasts a new “industrial” appeal. A highly decorated automatic movement is visible through the transparent front as well as the caseback like in the previous models. Under the optic thick and flat sapphire glass, ready to be admired is the U-77 Valjoux Top Soignè automatic mechanical movement, modified and personalized at U-BOAT specifications with black screws. This chronograph movement, reliable and accurate in performance, is a signature of U-Boat’s limited editions that distinguishes them from the standard models. Last but not least the innovative and patented sculpted pusher to eject the inner crown from its recessed position, enabling ease of adjustment for both date and time. Limited edition of 88 items. 46 mm diameter case in AISI 316 plus blackened stainless steel. 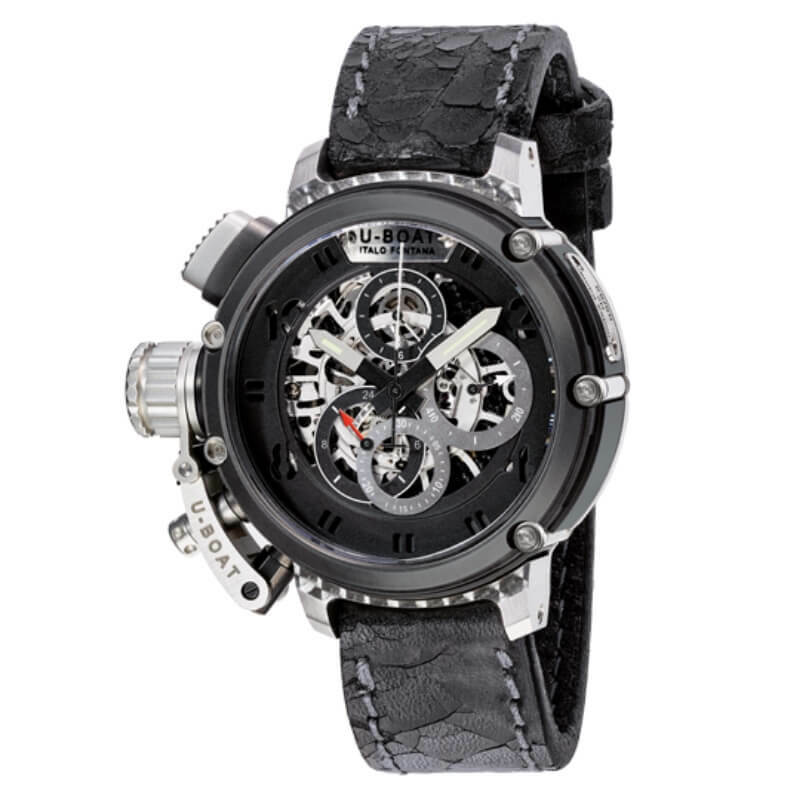 Skeleton U-77 Valjoux Top Soignè movement, automatic mechanical chronograph modified and personalized at U-BOAT specifications with black screws. Chrono functions, no dater. Hours, minutes, small seconds, chronograph 60s, counter 12 at 12, counter 30 minutes at 6. The bezel and the back of the case are locked together by external tubing and a customized key that ensure absolute water resistance. Skeleton dial on three levels. Handmade and hand finished black leather strap. Blackened buckle. Optic thick and flat sapphire glass on the front and back of the case. Oversized crown cover for an easy manipulation, secured on the case, positioned at 9 o’clock. Innovative sculpted pusher to eject the inner-crown from its recessed position, enabling ease of adjustment for both date and time (patented). Chrono pusher with milling on the external surface. Side window allowing the movements view. Personalized rotor in sterling silver consisting of three bridges locked through 3 blue screws.